Matching Dragoons: Jonah Hex #15 "Sawdust and Slow Death"
Jonah Hex #15 "Sawdust and Slow Death"
Rail Gap, Kansas, 1875 (can you hear me screaming already?) the Colter Traveling Circus of Wonders and Amazing Animals is holding it's closing night show. The crowd is watching the Crimson Pistolero as he shoots six whiskey bottles in midair. Of course, the Pistolero is Jonah Hex with a purple bandana over his face. And of course, since he is Jonah Hex, he gets his pistol back into the holster before the bottle pieces hit the ground. As the crowd is applauding a local yokel stands up, shouting that it's harder hitting a target that shoots back. Of course, that's not true for the Crimson Pistolero and he proves it by shooting the pistol out of the rabble-rousers hand before anything can happen. The ringmaster, Mr. Pike, tells everyone that it's all part of the show. Jonah then goes 'backstage' and talks to Paco, a dwarf that is also a clown. Then it's time for the star attraction and owner of the circus, Miss Sally Colter, who appears standing astride two galloping horses while also holding the reigns of three others ahead of her. She jumps off the horses' back and does a somersault through a ring of fire and lands on her feet to thunderous applause. After that is the big finale where all the freaks from the sideshows parade through the tent. Jonah has a flashback to a few days prior when he came upon the circus and talked to Sally about hiring on as a sharpshooter. She introduces Jonah to Hannibal Pike, the ringmaster, an unlikable smarmy fellow that takes delight in belittling people and poking lions and other animals with his cane. Back in the present, several more days pass and at another show we are treated to Maximillian, the armless knife thrower. He throws knives using his mouth and twisting his head quickly. Of course, Sally is his human target. Max throws knives one by one until Sally is surrounded by over a dozen knives. Then he takes two in his mouth and throws both at the same time with one landing on each side of Sally's neck. Sally never flinches and continues to smile happily. After that act, while Captain Ed Yager is taming his ferocious jungle cats, several of the freaks sneak out of the back of the tent & go into town. The freaks locate a man working into the night on a company payroll and they rob him of it. Hours later they return to the circus after the show has completed and the players are having dinner. Sally is thanking everyone for their hard work when Paco peeks into the tent and catches the attention of Pike. Pike leaves dinner and meets the freaks in his wagon, where they count the night's take of $1,300.13. Pike mentions that it is an odd amount and Paco sees it as an omen that they should stop stealing. Pike explains that the circus is on the verge of bankruptcy and without this extra income Miss Sally would lose everything and end up in the poorhouse. The freaks agree to keep stealing, only for Sally's benefit. Once they are gone, Pike, of course, gloats that all the money is going into a personal bank account of his back east. The next morning, everyone is tearing down the circus to head out of town. Paco comes hobbling across the circus grounds to taks to Jonah when a wagon of equipment slips it's brakes and hurtles toward Paco. Jonah dives forward, pushing Paco to safety. Paco thanks Jonah but Jonah says that Paco would have done the same for him. Another circus worker states that "we 'special' people have to stick together." Jonah appears to be startled at this acceptance of him. Days later (let's say 4, just cuz), the circus arrives at it's next stop and holds a huge parade through town. That night, Pike gives Paco the name & address of their next 'mark'. Paco asks if Jonah can help this time & Pike declines, saying there is something about Jonah that he doesn't like. Jonah is too independant, like the lions, and Pike pokes at a lion with his cane. Pike then spots a marshall coming from the main tent. Pike goes in the main tent to ask Sally what the law was doing. Sally explains that the sheriff said that there has been a series of robberies in the towns that the circus has performed in. Sally is going to call the circus together & see if anyone knows anything, because none of the workers would lie to her. Pike agrees with her and says that is what he is afraid of, then he smashes Sally's skull open with his cane. Pike then tears a piece off of Jonah's Crimson Pistolero mask and places it in Sally's hand and then leaves, planning on heading back east to his bank account. A short time later, Jonah is in his tent washing up and talking with Paco. Paco says that he hopes that Jonah can stay with them for a long time, but Jonah says that he needs to be moving on soon. Just then the entire freak show walks in, holding Jonah responsible for Sally's death.Paco tries to stand up for Jonah, but the freaks will hear none of it. They usher Jonah over to the main tent and strap him to the knife-thrower's target. Jonah tries to explain but the freaks start the knife-throwing act since they need a replacement for Sally. Maxamillian's first throw slices Jonah's left forearm, his second slices into Jonah's left thigh. A dwarf explains that Max's aim is off since he is so upset over Sally's death. Maxamillian is getting for the double knife finale (He can't miss with both knives) when Paco comes in holding a telegram that he found in Pike's wagon. The telegram is from a bank in Philadelphia confirming a deposit for $1,300.13. The freaks recognize is as the amount of their last robbery and realize that they have the wrong man. Information is traded between all parties involved and Jonah is reunited with his pistols. A plan is hatched and, as Jonah states, since they have been used, they should start returning the favor. A short time later, in the darkness, Pike is starting to sneak away to catch a train back east. Suddenly two bullets slam into the wagon side in front of him. Pike turns to see the sillouette of Jonah standing over by a tent. Pike starts to run, but a couple of shots hit the ground in front of him. He turns to run another direction. He runs a ways and then has to turn to avoid being shot. It's then that Pike realizes that since Jonah is an expert marksman, Jonah must be taunting Pike. Pike finds his only way out is to duck under the big tent. He crawls into the tent, into total darkness, and he hears an ominous CLANG behind him. Slowly several lamps are lit and Pike finds that he is in a huge cage, surrounded by the circus workers, all holding lamps. Pike demands to know what is going on. Jonah walks over and says that since Miss Sally is gone, everyone thought the circus would need a new big act. That's why they moved the lion cage and 'invited' Pike to audition. Pike calls them crazy, saying that they won't get away with it. Jonah agrees "Mebbe not - but then, ah guess tuh some folks thet ain't important anymore.." There is another ominous clang as a gate opens, letting the lions, who have been constantly tormented by Pike, into the cage. The last panel has Jonah walking away from the circus, casually flicking away his smoke, as we hear blood-curdling screams coming from the big tent behind him. Jonah's injuries - two knife wounds, left arm & left leg. Timeline - Still part of the framed Jonah saga, but dates were blatantly given. I can't let this date thing go, can I? 1875? But we have already established that it's probably 1877, haven't we? And there is no chance that this took place in 1874, is there? ARRRGHGHGH! I really enjoyed this issue, even though I'm reading a lot more into it than is actually there. This is a nice revenge story patterned after the movie "Freaks!" Reading this story you assume a lot of information that is not overly explained. You know that Sally is a lovely woman, taking in and loving all kinds of people. You know that Pike is scum and enjoys tormenting man & animal alike. And you realize that the freaks are taking no joy in Pike's death, they know that it will not bring back Sally, but a price has to be paid, no matter how ugly that might be. I would put this in the upper quarter of Hex stories and the idea of circus freaks was visited again (twice) in the new series. Next Issue: Stabbings, shootings, hangings, grave-robbing, ballistics and the DC Explosion in a 25 page story with The Wyandott Verdict! This sounds good. 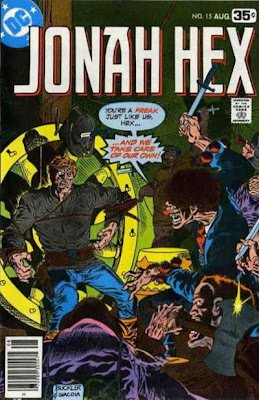 I must admit that trying to figure out the time line for Jonah Hex is mind-boggling. Did bloody EVERYTHING happen in 1875? Feeding the bad guy to the cats is a first for Jonah I think. Or maybe not, he IS quite versatile. Feeding to cats, yup a first. However he did throw a rabid corpse of a cougar on a guy once, long time ago. Hmm...the rabid corpse is a nice touch. I've always loved how Jonah had that extra little "twist" at the end. Heh. And your spelling is luvly.